Posted: February 8, 2019 Updated: February 8, 2019 by onlineph | Filed under Internet, Social Network, Technology, Tutorials. However, this option is only available within 10 minutes from the time the message was sent. After that, you will not be able to delete the message. To delete a message, you have to long press the freshly sent message. Along the bottom of the screen, there will be a couple of options. Select the new Remove option. You will then receive a prompt asking if you want the message to be Remove for You or Remove for Everyone. The first option only allows you to remove the message from your view. The other option will let you delete the messages from the conversation for all recipients. A placeholder saying “You removed a message” will then appear in place of the deleted message. The recipient will also see that a message was deleted. 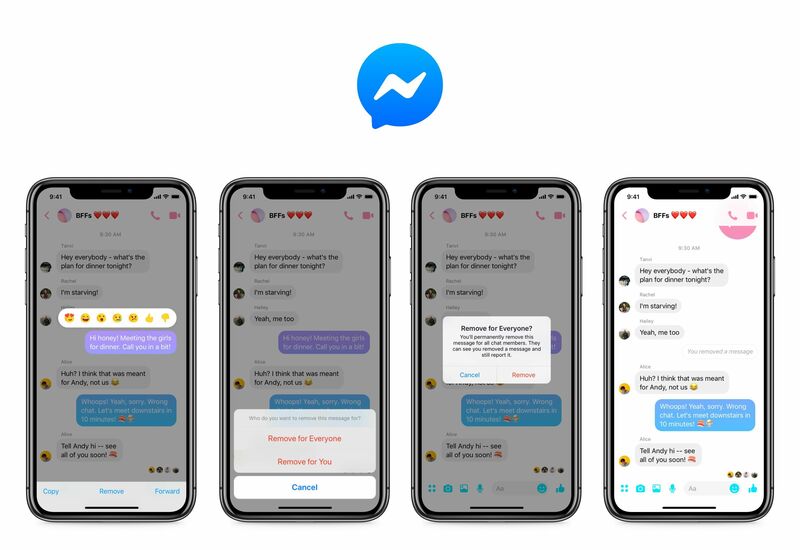 The same feature will be available when using Messenger via the Facebook website on a desktop. Instead of long press, you can click on the three-dot icon next to the message. Facebook noted that this option was created for those who have sent a message to the wrong recipient or those who simply mistyped a simple message. The remove message feature was made available to more than a billion Messenger users after it was revealed that Facebook co-founder and chief executive Mark Zuckerberg can remove his sent messages.